An estimated 19,000 patrons attended the sixth annual Saskatoon Rotary RibFest, held August 3-6 at Diefenbaker Park in Saskatoon. The total was down slightly from the record of 21,000 set in 2015. RibFest is organized by the Rotary Club of Saskatoon Nutana. RibFest Chair Boris Kishchuk thanked the ribbers, other vendors, entertainers, volunteers, sponsors and all the people who attended the event for making RibFest a great success again this year. “The crowds were fantastic, especially considering that we had some rain on Saturday," said Kishchuk. "It shows how much people love coming to RibFest." Prairie Smoke and Spice of Regina won the Peoples' Choice award while Smoke and Bones BBQ of Vancouver won the Judges' Choice award. The judges on the panel were Grant Devine, Chantal Devine, Darwin Hodges, Jeri Hodges, Tom Kishchuk and Lynne MacGillivray. The 50/50 prize totalled $7,555. The winning ticket number of RF2-017748 was held by Kevin Hobbs. RibFest offered four days of delicious ribs barbecued by some of Canada’s top ribbers, live entertainment, plus a kids’ fun area, food and craft vendors, beer garden, 50/50 draw and more. Admission and entertainment were free. 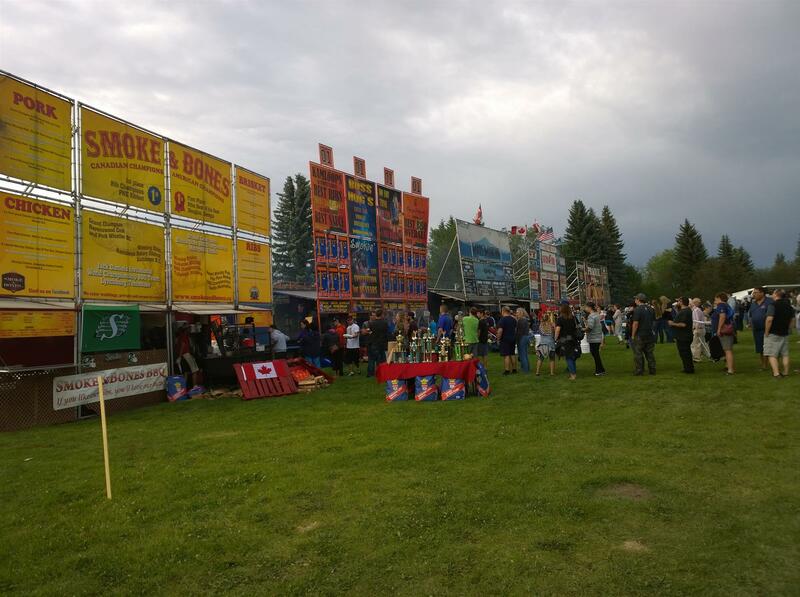 Funds raised through Ribfest support the Rotary Club of Saskatoon Nutana's community projects in the areas of youth, First Nations, literacy and education. Visit http://www.saskatoonribfest.com for more information. The seventh annual Saskatoon Ribfest will be held August 2-5, 2019. 20,500 hungry visitors attended the fifth annual Saskatoon Rotary RibFest, held August 4-7 at Diefenbaker Park in Saskatoon. Boss Hog's BBQ of London, Ont. won the Peoples' Choice award while Prairie Smoke and Spice of Regina won the Judges' Choice award. he 50/50 prize totalled $8,682.50. The winning ticket number was RF2-132046. The sixth annual Saskatoon Ribfest will be held August 3-6, 2018. Saskatoon Rotary RibFest will be held on the August long weekend, August 4-7, 2017, at Diefenbaker Park in Saskatoon. There will be fun and games for the whole family and, above all, mouth watering ribs and other tasty treats. Admission is free but donations to support the work of Rotary in the community are greatly appreciated, For details, visit http://saskatoonribfest.com/. Saskatoon Ribfest is pleased to announce that almost 21,000 people entered the Ribfest grounds at Diefenbaker Park over the long weekend from July 31 to August 3, 2015. Boss Hog’s was the winner of the People’s Choice Award. The winner of the 50/50 draw was Al Curtis of Saskatoon. Ribfest offered four days of delicious ribs barbecued by some of Canada’s top ribbers, live entertainment, plus a kids’ fun area, food and craft vendors, beer garden, 50/50 draw and more. Admission and entertainment were free. Ribfest is organized by the Rotary Club of Saskatoon Nutana working with the Big Brothers & Big Sisters of Saskatoon. Funds raised through Ribfest will support local and international projects. Visit http://www.saskatoonribfest.com for more information. The fourth annual Saskatoon Ribfest will be held July 29-August 1, 2016 at Diefenbaker Park in Saskatoon. 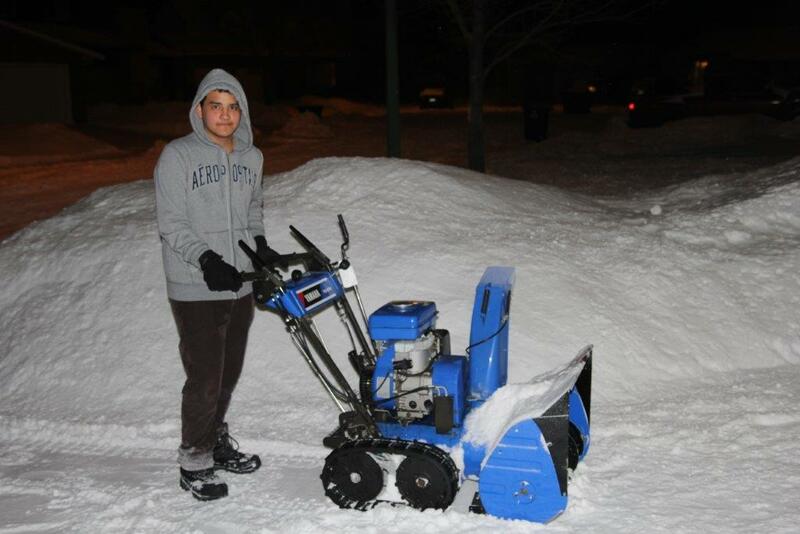 Rotary Exchange Student Aldo Jacome of Mexico uses a snowblower to clear snow following a recent blizzard in Saskatoon. RibFest is a four-day family event that will offer great food, live entertainment, champion rib vendors from across Canada, professional barbecue competition, kids’ fun area, food and craft vendors and a beer gardens. Admission is FREE so come on over to Diefenbaker Park on August 2 to 5th and enjoy some great ribs and entertainment. This years Duck Derby took place on Sunday, July 15 during the River Lights Festival. Unfortunately rain cancelled most of the days events other than the JetSki competition and the duck derby and with a fast river it was a quick race. All winners are posted below and will also be notified by phone. A big thank you to our main sponsor, Conexus Credit Union for their continued support. This years derby raised $ 4,000.00 and all proceeds will be used to support local Rotary youth programs. Thank you to Shearwater Tours for helping us collect the ducks on the river and to The Fishing Hole for providing fishing nets used to scoop the ducks from the river. Over $ 35,000.00 has been raised over the 9 years that we have run the duck derby to support our Rotary Youth programs. Thank you to everyone that purchased a duck and we look forward to your support again next year. HAITI FUNDRAISING DINNER A SUCCESS !!!! On June 1st, 275 people gathered at the Hilton Garden Inn to support the Rotary Club of Saskatoon Nutana's intiative to reconstruct the Greffin School in Port Au Prince, Haiti that was demolished during the devastating earthquake that struck the island in January 2010. Our special guest speaker was Senator Pamela Wallin who shared her experiences as a journalist, a public servant and growing up in Saskatchewan. Ian Van Norman, a former member of Nutana Rotary and our partner on this project thru his own charitable foundation gave a picture presentation on the reconstruction of the school and their future plans. Peter Eyvindson, another former club member entertained us with an inspriring childrens' story. Almost $ 30,000.00 was raised to support our total committment of 100k and we would like to thank all those that attended and those that made in-kind financial contributions. The Rotary Club of Saskatoon Nutana will be holding their Rotary River Duck Derby on Sunday, July 15 in conjuction with the River Lights Festival being held that weekend at River Landing. 1000 rubber ducks will be dropped from the top of the Idywyld Freeway Bridge at approximately 4pm on Sunday and float towards the finish line in front of the Traffic Bridge. The first 10 ducks that cross the finish line will win a total of $ 2000.00 with a first prize of $ 500.00. Conexus Credit Union is the presenting sponsor, tickets are $ 5.00 each and are available at both Saskatoon branches (Circle Drive East and at Preston & 8th St. E.) Tickets can also be purchased from Nutana Rotary members or at our booth that will be setup at River Landing during the River Lights Festival taking place from July 13 to 15. All proceeds from the duck derby support Nutana Rotary's local youth projects that include; Oskayak H.S. schorlarships, adventure and leadership camps and the Restotative Action Program in Saskatoon High Schools. 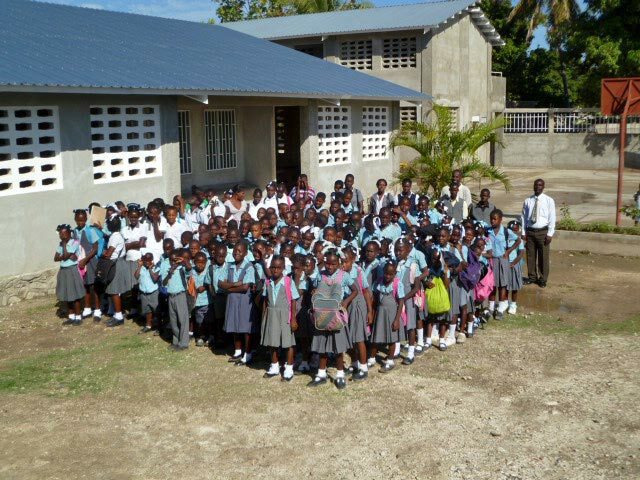 The Rotary Club of Saskatoon Nutana will sponsor a fundraising dinner on June 1 to raise money for Greffin School near Port au Prince, Haiti. The dinner will be held at the Hilton Garden Hotel in Saskatoon. Guest speaker will be Senator Pamela Wallin. Tickets are $125 and include a $75 charitable receipt. To purchase tickets, please contact Walt Pawlovich at 373-6621. Please help support this project by attending the fundraising dinner and/or by making a donation to the Nutana Rotary Haiti Education Fund. Nutana Rotarians particpated in 4 dinners in January; thanks to Scott's and Blackburn's who hosted on the 14 and MacGillivray's and Williams who hosted on the 21. Wonderful fellowship and food were enjoyed by all and some pictures can be viewed in the Photo Album section. The Nutana Rotary River Duck Derby sponsored by Conexus Credit Union was held on August 7, 2011 at 4pm in River Landing during the "River Lights" event. The duck derby raised $4,800.00 to support the local youth projects of the Rotary Club of Saskatoon Nutana. THANK YOU TO CONEXUS CREDIT UNION AND ALL THOSE THAT PURCHASED A DUCK. The 2011 Saskatoon Dragon Boat Festival was another great success with over 70k raised by teams to support ongoing research and education for The Heart and Stroke Foundation of Saskatchewan. 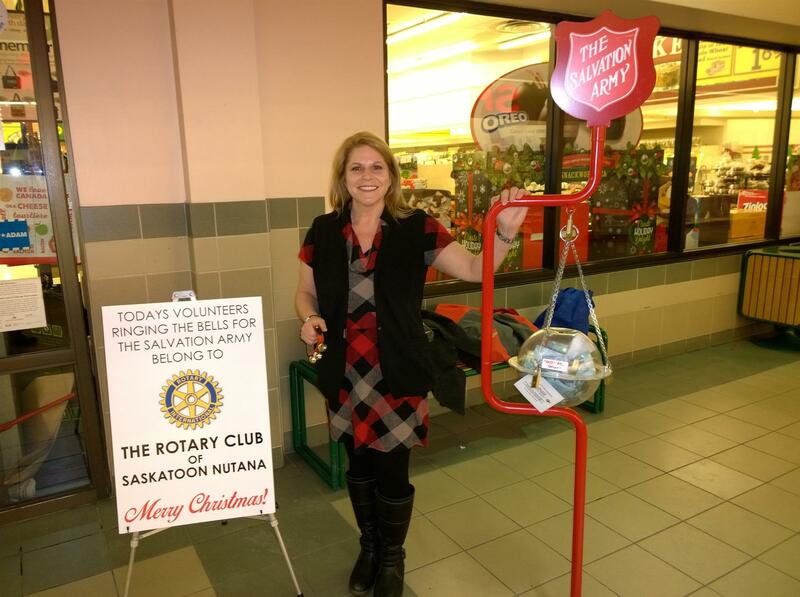 The event also raised approx 25k to support the local and international service projects that the Rotary Club of Saskatoon Nutana is involved in. THE SCARIEST CLUB MEETING EVER!!!!! Nutana Rotarians got into the Halloween spirit by dressing in their favorite costume. We were greeted & scared at the door by these two characters, GhostFace & RedFace which everyone agreed had the best costumes. Stan "Father" Garchinski had his tickle trunk with him and handed out numerous hats to many and for some it was an improvement. Lots of fun was had as each table got to draw their best pumpkin face, voted for the best costume, sang some Halloween songs, told their favorite halloween story and we even raised a few dollars for "End Polio". Thanks to Betty-Ann, Karen, Eileen, Dorothy, Walt and Stan for organizing a fun and memorable event. Check out the "SpookTacular" Photo Album on the left side of the webpage for some more memorable pictures. WELL DONE EVERYONE!!!! 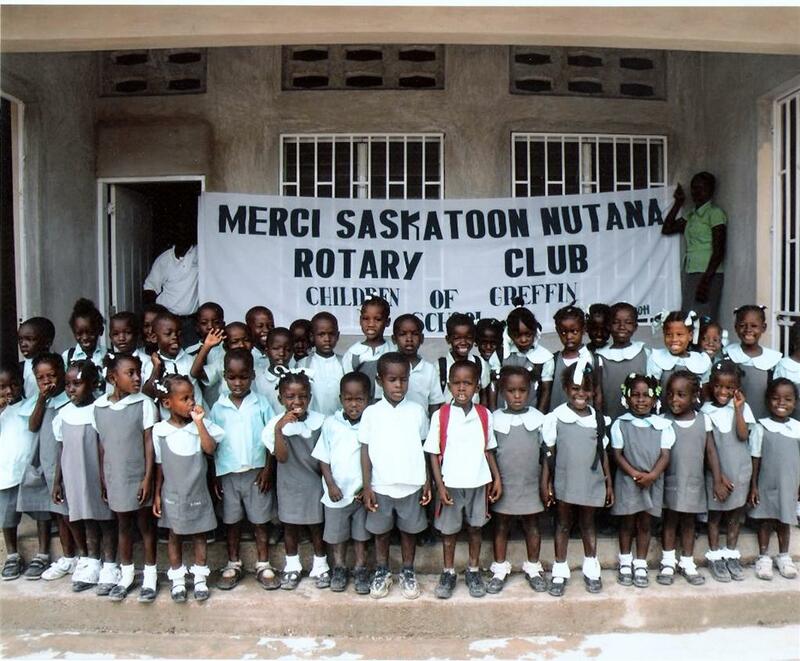 The Rotary Club of Saskatoon Nutana is working with the Van Norman Charitable Foundation in the reconstruction of an elementary school in Haiti that was destroyed during the earthquake that occurred in January 2010. Nutana Rotary has committed to fund the reconstruction of the school in the amount of $100,000 over the next five years. The Van Norman Charitable Foundation has agreed to match Rotary’s contribution by funding the costs of school children that attend the “Rotary”school. Governments publicly fund only about ten percent of elementary schools in Haiti. The reconstructed school is located on the outskirts of Port au Prince and consists of four classroom, a kitchen, cafeteria and office areas. The school reconstruction was carried out by Free Methodist Church volunteers from Canada and the United States working with local construction workers. Reconstruction started in the fall of 2010 and was completed in the spring of 2011. Teaching staff at the school is recruited and monitored by Compassion Canada. The school is open to all children and there are no restrictions on school attendance. welcome Eva Vida from the Rotary Club of Winnipeg as our District Governor for 2011-2012. Kalyan Banerjee, of the Rotary Club of Vapi, Gujarat, India, is Rotary's 101st president. This year the RI President is asking Rotarians to Reach Within to Embrace Humanity during the 2011-12 Rotary year. "In order to achieve anything in this world, a person has to use all the resources he can draw on. And the only place to start is with ourselves and within ourselves." RI President Kalyan believes that Rotary's strengths include its ability to attract leaders from different vocations around the world as well as its role in promoting peace. "My goal is for Rotary to become the preferred organization for today's generation to join and participate in to make the world better, safer and happier" he said in a recent Interview.